Afghanistan's chief executive has appeared live on television after surviving three suicide bomb attacks on a funeral he was attending. Abdullah Abdullah said Saturday that the trio of suicide bombers detonated their vests just as mourners were beginning to offer their prayers. The bombings killed at least 6 people and wounded 87. Abdullah called for an investigation into how the attackers were able to get so close to a funeral attended by senior government officials, just days after a massive truck bomb killed 90 people in one of the most heavily guarded areas of the capital. The funeral was for Salim Ezadyar, son of a senior Afghan parliamentarian, who was killed in clashes Friday between police and protestors who were demanding greater security. Abdullah called for an investigation into whether police used live fire against protestors. An Afghan official has raised the casualty estimates from a string of explosions in Kabul to six people dead. Wahid Mujro, spokesman for the Public Health Ministry, said 87 people were also wounded in multiple explosions — including three blasts at a cemetery during a funeral attended by government officials and members of parliament. An Afghan official says explosions in Kabul have killed at least four people attending a funeral reportedly attended by government officials, including members of parliament. Najib Danish, Interior Ministry deputy spokesman, says three explosions rocked a cemetery where Sen. Alam Ezadyar's son was about to be buried. 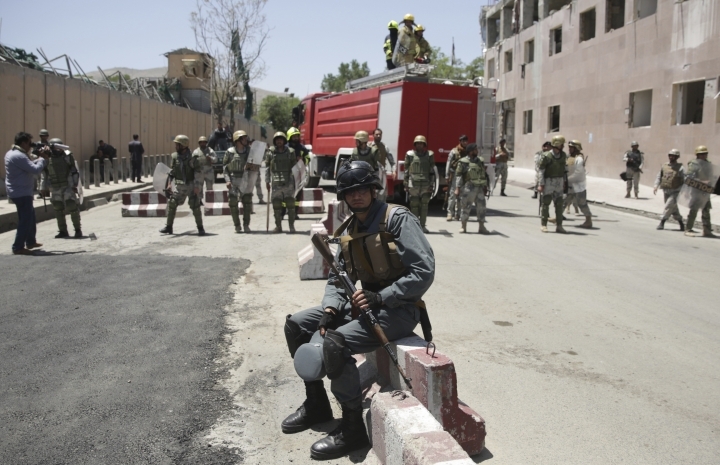 Salim Ezadyar was killed during a protest Friday attended by hundreds in Kabul, said. Ezadyar is deputy speaker for the upper house of the country's parliament. More than a thousand people demonstrated Friday demanding more security in the capital following a powerful truck bomb attack in the city that killed 90 people and wounded more than 450. Officials say several were killed and wounded. 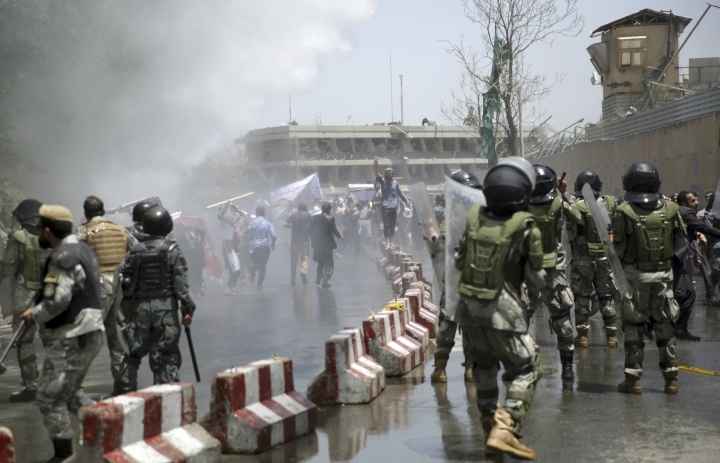 A demonstration in downtown Kabul that left several people dead has entered a second day. Scores of protesters passed the night under two big tents on a road near the presidential palace and the blast site. All roads toward the palace and diplomatic areas are being blocked Saturday by police and there is limited movement of vehicles and people. On Friday, demonstrators rushed toward police who fired warning shots and when they attempted to move closer to the palace, police sprayed them with hoses from a water tanker and later fired tear gas.